To heighten awareness on multiple issues that the Filipino communities are facing, a mural painting activity was conducted by a team of Josenians at Tungkil Elementary School in Minglanilla, Cebu last August 28. 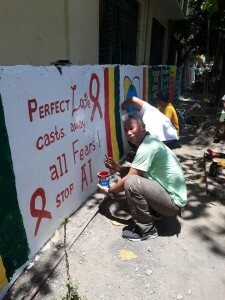 Student Activity Officer Jonathan D. Saso works on his mural painting design which talks about HIV prevention. The painted visuals and slogans talked about the promotion of nutrition, stoppage of the HIV stigma, refusal to succumb to illegal drugs, and quotes from Augustinian saints which may help its readers become better members of the society. Leaders of the different student organizations were convened by the Student Affairs Office (SAO) to participate in the activity. One of the activity’s main objective was to reconnect with the community according to Student Activity Officer Jonathan D. Saso. He added that the idea of conducting a mural painting came from Student Discipline Officers Maria Elena B. Yumang and Maria Jennifer Estrella. “To reach out to the community by sharing the skills (especially of the students) and also to demonstrate the art of imagination to depict the message of the Augustinian way of life,” Saso said. 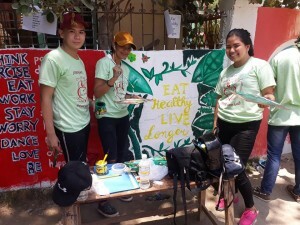 Josenian leaders pose for a shot in the middle of making a mural promoting the importance of healthy meals for a longer life. Robert John Medida, a student leader from Josenian Junior Diplomats, said he actually felt proud of himself after participating in the event. ” For me, the essence of the COP is about sharing your skills and knowledge to the community,” he added. Prior to the activity in Tungkil, a two-part lecture on strengthening family values and service as the fruit of interiority was done on August 21 at Don Bosco Retreat House, Lawaan, Talisay. The two-day formation session was originally scheduled for August 21 and 22 but it was rescheduled to August 21 and 28 due to bad weather condition. Among the participants of this year’s formation and Community Outreach Program (COP) were incumbent officers of Josenian Political Science Society (JPSS), Philippine Institute of Civil Engineers (PICE), and the Student Supreme Council (SSC). Last year’s COP was a clean-up drive at the coastal area of South Road Properties(SRP). Saso said that there are around 30 student accredited student organizations in USJ-R.